Pizza Pizza's Slices for Devices is back this month! 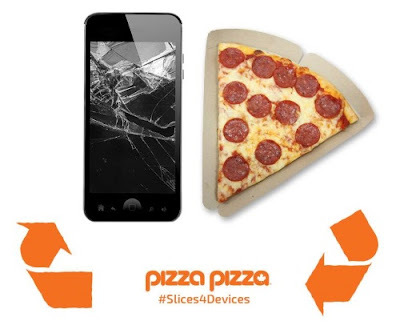 Recycle an old device and get a Free Pizza Slice! Trade in an old, unwanted or broken electronic device in exchange for a free slice of pepperoni or cheese pizza. They've partnered with Electronic Products Recycling Association (EPRA) and Ontario Electronic Stewardship (OES) to help customers who may be looking to spring clean their old electronics devices. All devices will be safely recycled and proceeds from the device refurbishment will be donated to Children's Miracle Network through Pizza Pizza's Slices for Smiles Foundation. This offer is available across Ontario, Quebec, Manitoba, Saskatchewan and Nova Scotia from April 1-30, 2016.